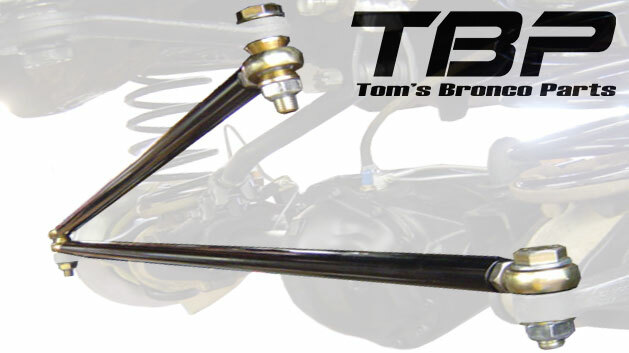 TBP Trail Terminator Heim Joint Steering Linkage for 76-77 Classic Ford Broncos. Linkage can be mounted above or below the steering knuckle. Comes with all mounting hardware. Knuckles and pitman arm must be drilled out for mounting hardware. This linkage is designed to fit front ends with 50'' from center to center on the knuckle holes where the tie rods connect. This measurement is commonly found on disc brake front ends. For narrower measurements (48") check part# 3881. Designed for off-road use. The Trail Terminator Heim Linkage is made of 100% USA Made Components and uses DOM Tubing. NOTE: Bronco's with weld on front shock mounts that attach to the radius arm CAP must be modified or removed. In addition, the drag link is designed to be used with a steering box that is installed in the factory location. Will not work with factory steering stabilizer bracket setup.